Why Do Most Galaxies Die? It's A Case Of Strangulation, Scientists Say : The Two-Way A team in England looked at thousands of galaxies that had stopped forming stars and determined that the vast majority of them showed signs that their stellar fuel supply had been choked off. 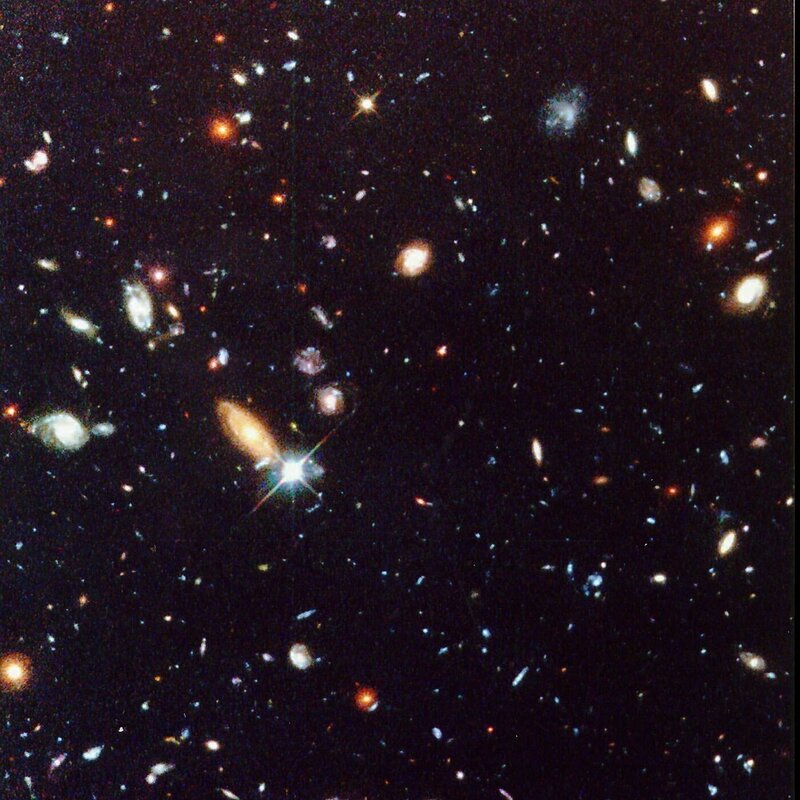 The view of the universe known as the Hubble Deep Field, presented in 1996, shows classical spiral and elliptical shaped galaxies, as well as a variety of other galaxy shapes. Scientists think they may finally be resolving a decades-old cold case as to what is killing galaxies: They're being strangled. Astronomers have long known that galaxies fall into two main categories — those that spawn new stars (like our own Milky Way) and those that don't. One hypothesis is that the light elements hydrogen and helium are slowly choked off, essentially closing the tap on the fuel needed to form stars. A second hypothesis is that those same star-forming gases are stripped away, perhaps by the gravitational pull of another nearby galaxy. Publishing in Nature this week, Yingjie Peng, an astronomer at the University of Cambridge in England, says his team compared 3,905 star-forming galaxies with 22,618 galaxies that had shut down star formation. They determined that the vast majority of the star-formers contained less of the heavier elements — forged by dying stars as they fuse hydrogen and helium into everything up to and including iron — than those galaxies not forming new stars. Science magazine notes: "This is just the pattern expected if infalling gas sustains their star-forming careers, because this gas has little iron and therefore dilutes a galaxy's iron abundance; once the gas stops falling in, the iron abundance rises as exploding stars forge the element. The study finds that about 4 billion years elapse between when the gas stops falling in and when stars stop forming. In the Milky Way's case, lots of gas is raining onto it, so our galactic home won't go from sizzle to fizzle any time soon." "This is the first conclusive evidence that galaxies are being strangled to death," Peng was quoted by Discovery News as saying. Peng and his team say that strangulation accounts for how 95 percent of galaxies, including ours, will die, but in the case of particularly massive galaxies, "the evidence was not conclusive for either the strangulation or sudden-removal theories," Peng said, according to Space.com. "Although the researchers have found that most galaxies die via strangulation, they still need to better understand the mechanism that causes the strangulation, Peng said. One possibility is that nearby galaxies may help deplete a star-forming galaxy's gas supply, Peng added. "The team's investigation analyzed relatively nearby galaxies, and the next step will be to look at more distant galaxies, which provide a picture of what the universe looked like when it was young. This further research will enable researchers to establish a more complete picture of how galaxies form and evolve, Peng said."